Global wearable computing is growing rapidly with a wave of "smart" watches that integrate with smartphone technology and other Internet-connected garments (for fashion, gaming, healthcare, for example) expected to come into the market over the next few years. According to Juniper Research, a mobile research specialist providing market intelligence, the wearable-tech industry has a compound annual growth rate (CAGR) of 43.4 percent from around $5 billion forecast for 2013 to $9.2 billion in 2014 and more than $30.2 billion for 2018. Juniper expects that fitness and sports wearables, combined with healthcare devices, will together hold more than 80-percent of the share. A study from IDC, “Worldwide Wearable Computing Devices 2014-2018 Forecast and Analysis,” suggests that, by the end of 2014 alone, there will be over 19 million units of wearable computing technology, in various forms, shipped. The market is likely to exceed 485 million in annual shipments by 2018. Mobile gadgets are moving forward and possibly away from smartphones and tablets entirely. Today, wearable computing has given a glimpse into the possibilities for future gadgets that will integrate technologies such as augmented and virtual reality into human life more seamlessly. The challenges of introducing compact phone technology into a body-worn device do not stop even companies traditionally involved in other areas of the technology industry, like Chipmaker Intel Corp. which is also looking to make its mark on this growing industry. Attempting to stay atop the technology market, Intel has decided to invest in the wearable computing revolution and to partner with fashion brand Fossil Group to create a new line of designer smart bracelets and watches that will impact the ways consumers see wearable technology. The collaboration comes at a time Intel tries to expand beyond the personal computer industry into new markets; the renowned company believes in the potentials of developments of wearable-computing devices for any environment where information or communication is desired. 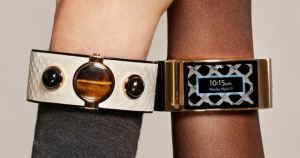 Intel, which has already been working with the design company Opening Ceremony to launch a fashion bracelet with semi-precious gems, communications features and wireless charging, now forms a partnership the watch and jewelry-maker in hopes to succeed where other companies have been unable to, and bring true fashion and style to wearable devices. As noted in a blog post by Intel’s corporate vice president and general manager of the New Devices Group, Michael A. Bell, Intel and Fossil Group are cooperating on technology-oriented fashion products that would accelerate innovation in wearable computing, smart and connected. More of these kinds of collaborations are on the horizon to bring fashion and technology together in the world of wearable technologies.